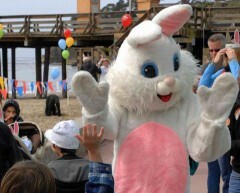 Hop on down to Capitola Village for an Easter Egg Hunt on the beach! Kids 12 and under can hunt for candy-filled eggs hidden in the sand. The Easter Bunny will be there! Please limit 3 eggs per child so there is plenty of fun for everyone! Be sure to bring your camera to capture a fun, spring day on the beach in Capitola!